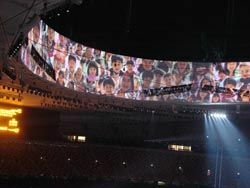 "This is the first time that we have used such a massive number of projectors for the opening ceremony – a combination of approximately 150 Christie Roadster S+20K and Christie CP2000-ZX models, with brightness levels up to 20,000 ANSI lumens," comments Sha Xiaolan, chief lighting designer, Olympics Opening and Closing Ceremony Committee. "As the projected visuals played a pivotal role in the opening ceremony, the visual solution was also the most extensive and complicated in the history of the Games. Christie projectors maintained their excellent performance and reliability from day one of the rehearsal, right through to the live event." The three-and-a-half-hour opening ceremony included four parts: opening addresses; performances; entrance of athletes; and lighting of the main flame. Centered on the theme of "Civilization and Harmony," the extravagant performances were designed by renowned film director, Zhang Yimou, and aimed to convey the "conception of harmony from an international perspective." In order to uphold the artistic integrity and complex design elements for the show, the projection technology needed to endure rugged use, as well as high temperature and humidity levels. Working together with Wincom Technology Development Co., Ltd., one of Christie's most valued and prominent Business Products partner in China, 84 Christie Roadster S+20K 3-chip DLP® projectors were provided for the spectator area in the newly-constructed Beijing National Stadium. These incredibly bright projectors, outputting 20,000 ANSI lumens, are the de facto standard for rental/staging with a rugged design for durability and ease of operation. Adding another creative element to this spectacular event, Christie partnered with Beijing Time Antaeus Media Tech. Co., Ltd., to provide 63 Christie CP2000-ZX models for the ceremonies – the brightest all-in-one digital cinema projector in its class. The unique performance using Christie's acclaimed DLP Cinema® projectors, was the first-of-its-kind and illustrated the flexibility of Christie's range of visual solutions. Following the ceremonies, the projectors will be deployed in theaters across China, as the country continues to expand its conversion from film to digital. "It is an extreme honor to be a part of the world's greatest sporting event and to project stunning visuals for the 'One World One Dream' vision of the 2008 Beijing Games," comments Jack Kline, president and COO, Christie Digital Systems USA, Inc. "Our commitment to innovation in projection technology has brought Christie to the forefront of some of the highest profile events in the world. Our passion is to deliver purpose-built visual solutions to help our customers achieve their unique goal of artistic expression." To ensure exceptional image quality for the live event, Christie's engineering team performed extensive testing off-site to verify conformance with all visual parameters set by the Games' audio/visual committee. The projectors were also tested under extreme temperature and humidity levels to ensure optimal performance and reliability in the hot and humid Beijing summer climate. The technical team also spent more than two months on-site at the Beijing National Stadium working with the visual department daily on the installation and fine-tuning prior to the Games.